learn how to use a breadboard. Hosted by klaatu on 2015-01-23 is flagged as Clean and is released under a CC-BY-SA license. In this two-part series, Klaatu introduces you to the Arduino. 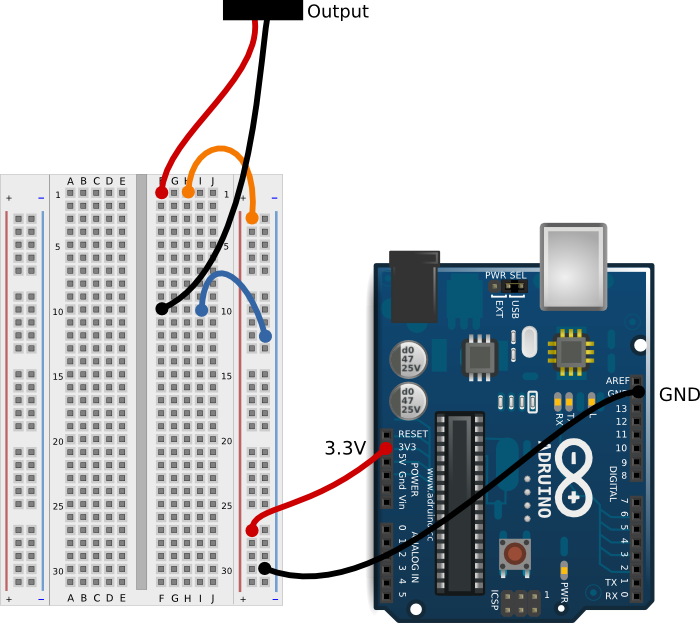 First, learn about the breadboard and how to make electricity course through it in order to power your very own simple circuit. And here are diagrams of the simple circuits that Klaatu constructs. Good show. Beat me to it...I have show notes for three shows about Arduino, just need to do the recordings. Just a note about 3v3 on the Arduino board. This is not a typo; it is common practice in electronics to replace the decimal point with the unit. So 3v3 is 3.3 volts, 2n2 stamped on a capactor or on a circuit diagram is 2.2 nano-Farads and 4k7 against a resistor on a circuit diagram is 4.7 kilohms. My Arduino shows were going to be about the command-line tools available for programming. Heavily catching up, just listened yesterday. Loved it. It was entertaining to listen to you doing every single step and seeing you do it before my minds eye. I'd never thought about describing it in such detail, but you have a point there. Surely there are a lot of listeners just starting out with this stuff and you pick them up right at the beginning, to lead them further on. The 3V3 are sorted out by Mike, so let me comment on the "speaker". It's worth noting that whenever you say speaker, you actually mean "buzzer". The buzzer includes already some electronics to generate the tone, so we hear the beep. With a speaker (or headphone,...) on its own, you only will hear crackling sounds the moment you close or break the circuit. Due to the low resistance of the speaker coil, there can be a high current flowing, which might damage it. So when using a speaker, please add a series resistor or capacitor.